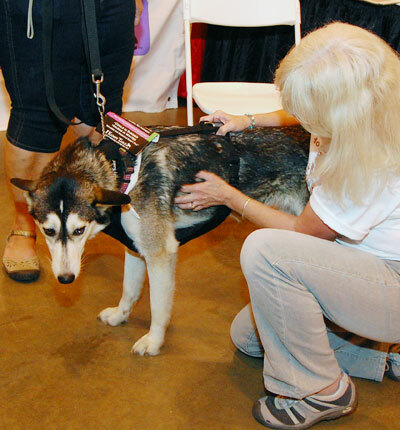 This past weekend's Amazing Pet Expo in Houston was alive with excitement. Our Event Barkers partner, DogTipper.com, was on hand to share in the fun. One of Paris' feel-good tasks was the sharing of a batch of Kumfy Tailz warming and cooling harnesses with three very lucky shelters: Miniature Schnauzer Rescue of Houston, Corridor Rescue, and Husky Haven. Being a Florida girl, I'm particularly thrilled that a Husky group got some of these therapeutic harnesses to aid in keeping them cool during hot Houston Summers. I'm feeling pretty good about these pups during the upcoming heat. You can check out Kumfy Tailz' solution for your own dog's need for cooling or warming at their website, on Facebook and via Twitter. Be sure to tell them that All Things Dog Blog sent you.